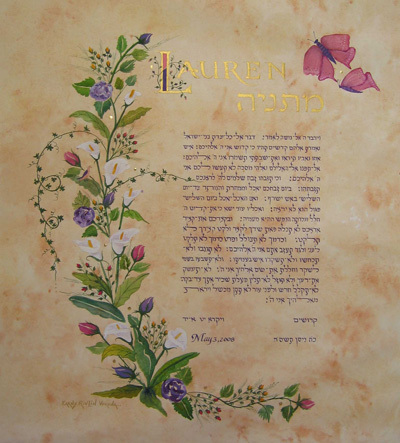 The Bat Mitzvah Haftarat Sh'kalim written in purple on the "parchment " background is decorated with the colourful bouquet of pink and purple Roses, Calla Lily and pink and orange Rose buds. 23K Gold Leaf dots are sparkling in between the flowers. The Bat Mitzvah name in Hebrew and English is illuminated with matching pink and purple. Ink: watercolour, Gouache, Dry Pigments and 23K Gold Leaf (optional).